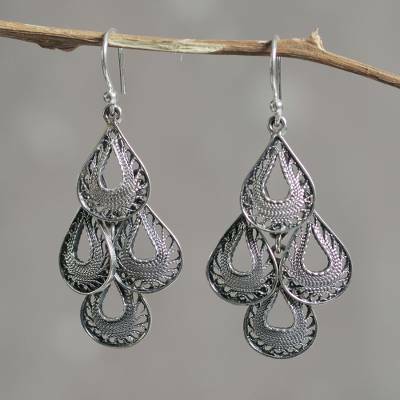 Silver Filigree Artisan Chandelier Earrings, "Dark Raindrop Cascade"
Four dark, lacy raindrops fall in a dancing cascade. Intricately crafted of oxidized sterling silver strands, these filigree earrings are the handiwork of Giuliana Valz-Gen.
You can find sterling silver filigree chandelier earrings 'Dark Raindrop Cascade' by Giuliana Valz-Gen in jewelry categories such as No Stone Earrings, Silver Earrings, Sterling Silver Earrings, Chandelier Earrings and Filigree Earrings. Enjoy exploring these sections for other Novica treasures.